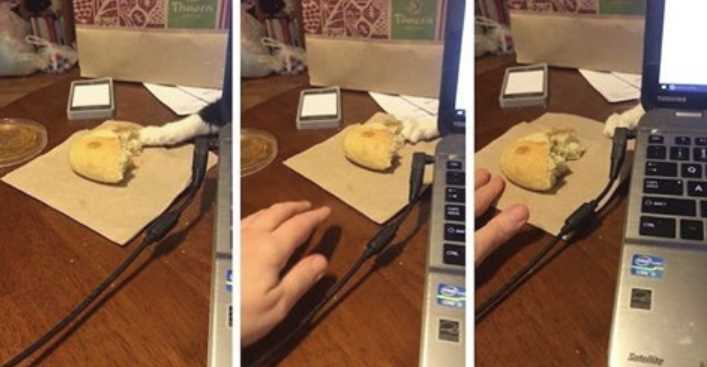 A very silly little cat named Mew Mew who lives in Blacklick, Ohio, sneaked behind the computer where her human Kelley Fultz was working, caught the scent of a yummy baked good and stuck out a surreptitious white out to drag the half eaten piece of break away by the napkin. Fultz, however, was having none of that and pulled back. This impromptu game of tug-of-war went on for a bit, but Fultz eventually emerged victorious but with a torn napkin.